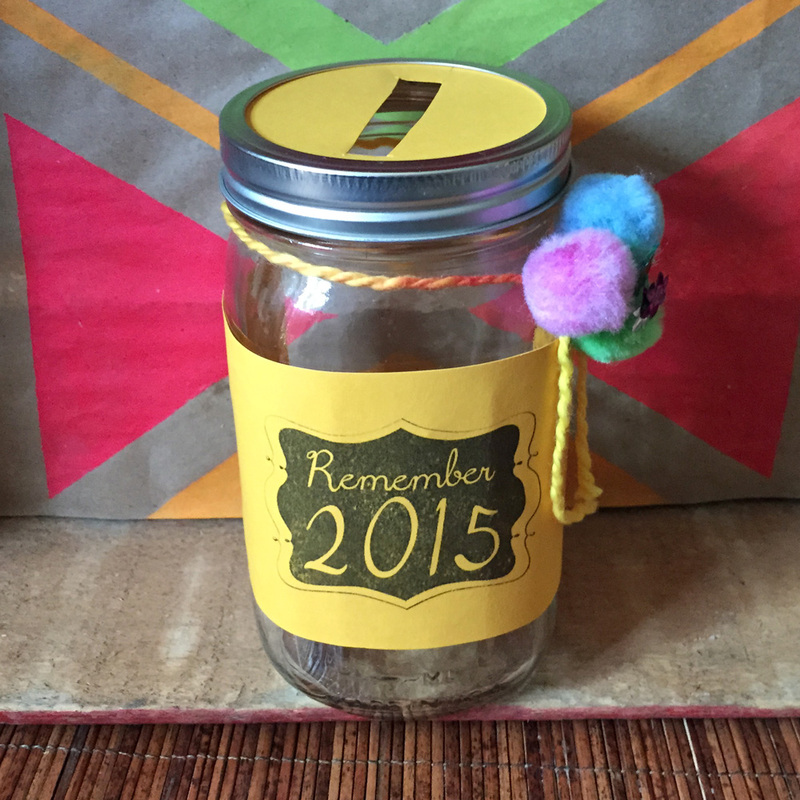 We Made DIY Rememberlution Jars, And Had A Surprisingly Great Time! We (all of us here at UnLa) took a cue from Buzzfeed, and decided to try out making Rememberlution Jars instead of making New Year’s Resolutions this year. If fits what we do here, which is aiming for fabulous imperfection. It’s also a chance to pat ourselves on the back for all of our incredible accomplishments (whatever they may be) from 2014. Plus, we just like crafts. So we tried them. And we gotta say… the art was incredible! Here’s my jar, quickly put together with Rene’s designs, a quart mason jar, and some glue. I have to admit, this was a lot of fun to create, and it makes me look forward to the challenge of filling this jar with some exciting misadventures for the new year! I highly recommend grabbing a jar yourself and crafting it into something that will inspire and encourage you to look at the new year in whatever way you choose. I think that’s what I like about these jars, you can make your jar mean whatever you want it to and function however best works for you. 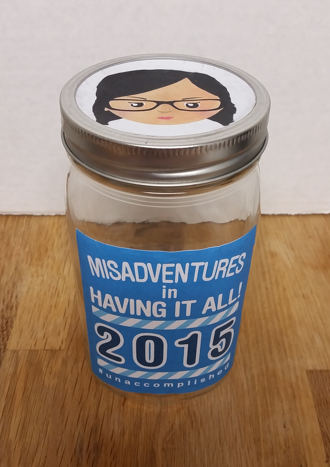 For me, I’m hoping to fill my jar with (un)accomplishments, experiences, and whatever else I feel like adding to it. 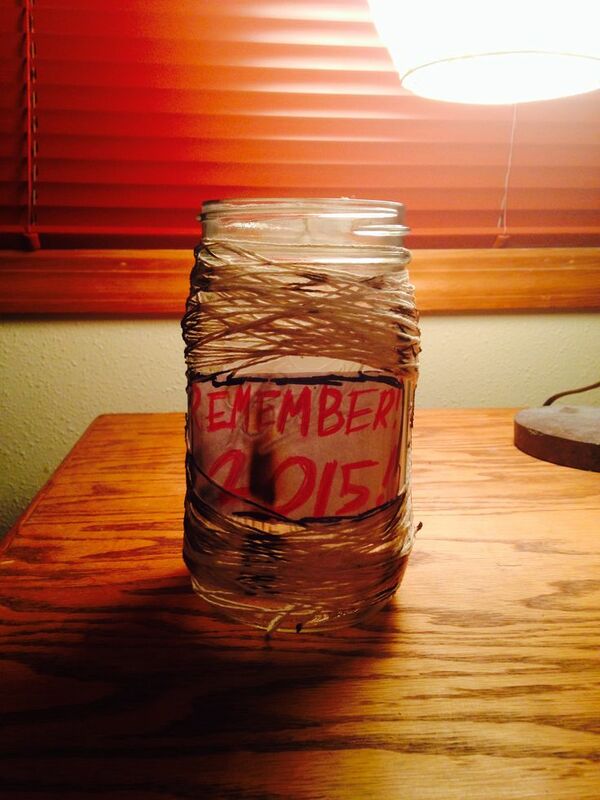 In our house, we decided to include in our Rememberlution jar funny quotes or jokes we make throughout the year. We are the kind of people who like to quote ourselves, so writing them down and putting them into a jar seems as good a way as any to document the hilarity that takes place in our duplex. But really, I have a feeling that without our sardonic humor, our jar would be looking rather empty come next December. I designed a little printable, which looks cute on colored card stock or regular printer paper. You could also print on a 8.5×11” rectangle of wrapping paper, which is an unexpected source for printed craft paper. I used a quart Ball jar, so the printable image fits on one side of that at it’s current size of 3”. My laser printer gave the print sort of a chalkboard look, which I am cool with. I used a glue stick to attach the label, and adorned it with a little yarn, poms and sequins. I know that if I don’t make it easy to submit my Rememberlutions, I’m not gonna do it. So, I went ahead and cut out some scraps of paper to keep beside the jar. Since I don’t dust, I figured I better put a top on it. But since a regular screw on lid would require an extra step, I concluded a small slot would make an easy drop in system. To do this, I just traced the ball jar outer lid, and cut my card stock that size. Then I cut a small rectangle in the center, like a piggy bank. Something about dropping it in the jar through the slot makes it feel more official. Who grew up with the concept of New Year’s Resolutions? <raises hand> I’ll reluctantly admit I did, but as an adult I’ve really strayed away from this practice. I’ve discovered that I have these crazy “perfectionist” tendencies…so when I, inevitably, fail at attaining my goals after a few weeks or months, it makes me a little bit crazy. We happened upon this article, and I LOVE, LOVE, LOVE the idea of a “Rememberlutions” jar; a positive, a thing to collect the important things that happen throughout the year. Like an annual time capsule you can paw thru anytime you want to remember or perhaps even to evaluate how your year is going…what’s not to love? It’s always interesting to look back and see how your life takes these twists and turns. The last 10 years have had some crazy twists & turns – each interesting and diverse, each with their own ups and downs…. and I’m currently in a season where I’m actively working towards some very specific goals. Not going to get into that here and now, but let’s just say that I am excited to see what 2015 brings. 2014 was largely a year of discovery for me. I started the Movie Challenge, solidified my business, discovered the horror community, and joined a book club. I also managed to get my own book published, and learned what I was to be a published writer. So lots of fun things came my way! But one of the most meaningful cultural experiences that I had in 2014 was reading The Absolute V for Vendetta. I was already a huge fan of the film version of this graphic novel, so to read all of it plus see additional bonus art was a great treat. So I decided to pattern my jar after the imagery of the graphic novel. It represents how I feel about this past year: I worked hard, fought hard, and have started to see the fruits of many efforts I had started earlier. I have nothing but hope for this coming year, and will remember every step in 2014 that took me there. 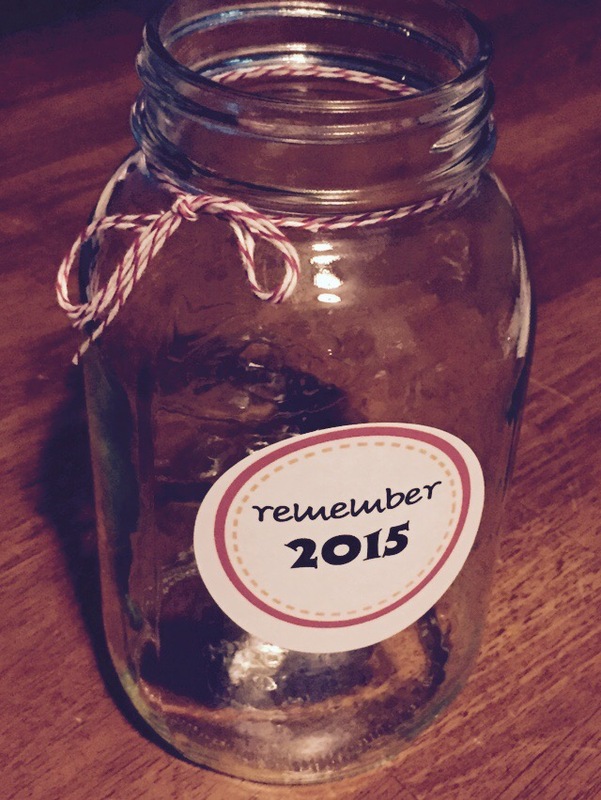 We’re talking about our jars on Instagram with the hashtag #RememberJars and #Remember2015. Who else made Rememberlution Jars this year? How did it go for you?